What makes junk mail junky? The junk email I get about replacement windows, oil change coupons, and life insurance doesn’t really bother me. Somehow I got on a list of millions of people who own a house, own a car, and can still fog a mirror. These emails go out in bulk and luckily my spam filter traps most of them. Are you talking to me? Really? What does bother me though is the inappropriate email I get that isn't sent out by the millions. It's the ones that come out from a real person who somehow thinks I'd really be interested. I get several of these every week from PR people who want me to talk with their client who’s been named “something or other of the year,” or who thinks I ought to do a blog post on “Promotional Products Work! Week,” whatever that is. A few weeks ago, someone sent me a press announcement about changes to tax law in Idaho. Huh? These emails are friendly enough, and I’m certain that a new tax law in Idaho is very interesting to someone… but not to me. Anyone who's spent any time trying to figure out what I would really be interested in would know that. I’m not asking folks to do a lot of work here. Thirty seconds on my website or LinkedIn profile will tell you everything you need to know. So other than a rant about junk email that finds its way to my inbox, what does this have to do with software-as-a-service (SaaS) marketing? For one thing, this kind of inaccurate marketing costs time and money. Some marketing or PR person spent at least a little bit of time putting together the note... though obviously not enough time to figure out whether I’d really care about whatever it is they're promoting. And if they follow up the note with a phone call, it’s even more time-consuming and more expensive. The bigger cost though is credibility and trust. And for SaaS businesses, that means a lot. Remember, SaaS marketers are selling a promise, not a product. They are promising to deliver some benefit over the life of the subscription. Establishing that kind of trust first requires that the vendor spend a little bit of time finding out about the prospective customer. What kind of tasks are they responsible for? What kind of solution might help them succeed? When a SaaS marketer sends out an email to a prospect before they know anything about the prospect, they’re off to a bad start. It’s tough to start a relationship with someone when you haven’t bothered to find out anything about them. All you’re likely to do is waste time and money and annoy the prospective customer. Companies get more from software-as-a-service (SaaS) solutions than just lower cost. So says a recent study conducted by IBM. It reveals that companies find that the greatest benefits from SaaS solutions are more collaboration, a better customer experience, and faster time-to-market. For anyone that’s been marketing SaaS solutions for any amount of time, those finding aren’t terribly surprising. don't do that often. For some reason or another, many just don’t get around to asking their customers why they bought their solution. Too bad. You can hear a lot just by listening. I know that sounds remarkably simple (and like something Yogi Berra would come out with.) But it’s true. Why do people buy your solution? I ask. And then I listen carefully. What problem were these people trying to solve? How big or costly was the problem? Where did they look for solutions? What alternatives did they consider? What’s been their experience with the solution? Were the original problems resolved? It takes some practice, and there are advantages to having an outsider ask the questions. People know I’m not trying to sell them something. And they say things that they might not share directly with the solution provider. Without this kind of information, it’s difficult - no, make that impossible - to develop a compelling value proposition and messages. How can a SaaS provider tell a prospective customer that they have a solution that the customer needs... if they don’t really know what the customer needs? And without a compelling value proposition, SaaS companies can waste a lot of money on marketing campaigns that don’t work. Given the way the SaaS business model works, that’s money most can’t afford to waste. I know you’re up to your eyeballs already with your 2014 planning, but I’m going to add another chore to your “to do” list. Sorry. Review your value proposition and messages. Most of your marketing plans are meant to deliver your messages to your target audience. That’s what email campaigns, presentations, webinars, press campaigns, website overhauls, white papers, data sheets, events, customer conferences, and search engine marketing are all about. So before you do any of this stuff, you should think about the messages themselves. Do they mean anything to the people you’re trying to reach? Do they address their problems? Do they distinguish your solution from alternatives? Do they compel the prospective customer to act? In other words, is your value proposition still valid and effective? A value proposition and messages aren’t things I recommend you tinker with very often. Consistency and repetition are good. But they are worth revisiting from time to time. After all, things do change. The things customers care about might change. For example, for some buyers, mobile is much more important now than it was a few years ago, so you’ll need to address that. Or new competitors may be have come into the market. That may mean you’ll need to update the way you talk about the unique advantages of your solution. The best way to figure out if your messages are still valid? Ask your customers. There are a few ways to do that: surveys, focus groups, interviews, A/B testing, monitor relevant conversations on social media, etc. However you decide to do it, it’s worth going through the effort from time to time. Why not now? There's a guy in my town who advertises himself as "The Bulkhead Man." What he does is install the entryways that go from the outside of a house into a basement. Most are heavy steel doors that are mounted onto the concrete foundation. Here's a photo of mine, partially obscured by a very healthy holly bush. I assume "The Bulkhead Man" could probably handle a lot of other construction projects around the house: build a deck, hang new cabinets, replace siding, whatever. He could rightly call himself a "contractor" or "handyman." But that would be a bad idea. Then he'd be just another guy in the long list of other "contractors" and "handymen" who advertise in my local paper. His ad would be stuck in with about two dozen others, instead of being the one and only "bulkhead man." If I needed a new bulkhead, believe me, "The Bulkhead Man" is the guy I'd call. And I'm probably like most people in that way. Most of the time when we're looking to fix something, we're looking for someone with particular expertise, a specialist in delivering just exactly what we need. This same logic applies to people searching for business solutions. They're usually not looking for something that can "do anything for anybody." They're looking for a solution to their particular problem. How can software-as-a-service (SaaS) companies can take advantage of that logic? One word: Focus. Focus lets companies build visibility and a reputation as experts in their particular niche. It lets them distinguish themselves from the pack. When someone searches for solutions like theirs, they rank at the top of the list. When someone sees them at a show or receives an email from the company, they pay attention. "Hey, these folks have something that's exactly what I'm looking for!" A SaaS company can focus on a particular problem or task. For example, "our solution is specifically designed to help eCommerce companies more quickly and accurately update the inventory they present online." Or it can claim that its solution is developed for a particular kind of customer, as in "this product is built for companies with teams of 5-40 customer support reps."
A company could even claim a specific geographic specialty. For example, "our solution is designed to help public school administrators meet the unique reporting requirements of the State of Florida." If you think about it carefully, you may find other ways to identify your particular market segment. Contact me if you need help. Believe me, I know it's difficult to narrow in on a specialty and there's lots of temptation to present yourself as "we can do anything for anybody." I talk with a lot of companies that are rightly very proud of what they've built, all the things it can do, and all the markets it can serve. "Yes, it solves that one problem well... but wait. It does so much more." My advice in most cases: focus. Or at least take on a carefully selected handful of well-defined segments. Focus is especially important if you're competing in an established market with a few 800-lb gorillas. In the market for CRM solutions, for example, if you get head-to-head with companies like salesforce.com, they'll easily out-spend you with their vast marketing and sales budget. You'll be buried. The key to survival in the SaaS world is getting your money's worth from what you spend on customer acquisition. (See "Marketing Spend; How Much is Enough?") Once you've spent money on developing your product, sales and marketing expenses are likely to be among your largest on-going expenses. For your business to thrive, the return on that spending - the long-term customer value - must exceed the acquisition costs. With focus, a company can distinguish itself from competitors, make itself easier to find, attract more leads, and close more business. What does that means in terms of the "customer acquisition cost (CAC)/ long term customer value" (LCV) formula? If the company spends $1 on sales and marketing, it's got a better chance at earning back much more than that in long-term customer value. Don't just be another company that does everything that everybody else does. Be the one and only "bulkhead man." "How would you spend a $30,000 budget for marketing an SMB software-as-a-service (SaaS) application?" He's selling into "a huge but highly competitive market." Based on feedback from about 10 active users, he explains, "I feel confident my application is ready to go to market." Now it's just a matter of where to spend the $30,000. My advice: Put the checkbook away. Sure, the company could try several marketing tactics that might be helpful and reasonably cost-effective: search engine optimization (SEO), Google adwords, PR, and others. But in a highly competitive market, $30,000 won't go far. The company could easily spend that amount on adwords in a single month, and good SEO or PR professionals need to get paid. Before it spends any money on specific lead generation activities, the company should first figure out why anyone would buy its product. And in a highly competitive market, why would they buy it from them? If the company is facing well-established and well-funded competitors, it'll need to articulate a significant advantage over these other solutions. A few extra features aren't nearly enough. A new solution can't just be better; it needs to be a lot better. Once the solution is built is not the time to start marketing. Companies should think through these messages and their value proposition much earlier in the process. If you're interested in building a viable business, developing a compelling value proposition is just as important as developing a sound technology solution. Marketing and messaging are not after-thoughts. If you don't know who should buy your solution, what problem it solves, and why it's better than anything else out in the market, no amount of money - not $30,000, not $300,000, not $3 million - will help much. Sorry to break this news to you, but customers don't really care about you. "What problems can you solve for me?" "What experience do you have with companies like mine?" "What do you know about my business, my market, my product?" You may have a broad range of expertise. You might have solved problems for all kinds of different companies in all kinds of different industries. You might know a lot about a lot of different markets. Prospective customers really only care about themselves. What do you know about their market? What can you do for their business. There's no problem with that. After all, it's their business and their money. 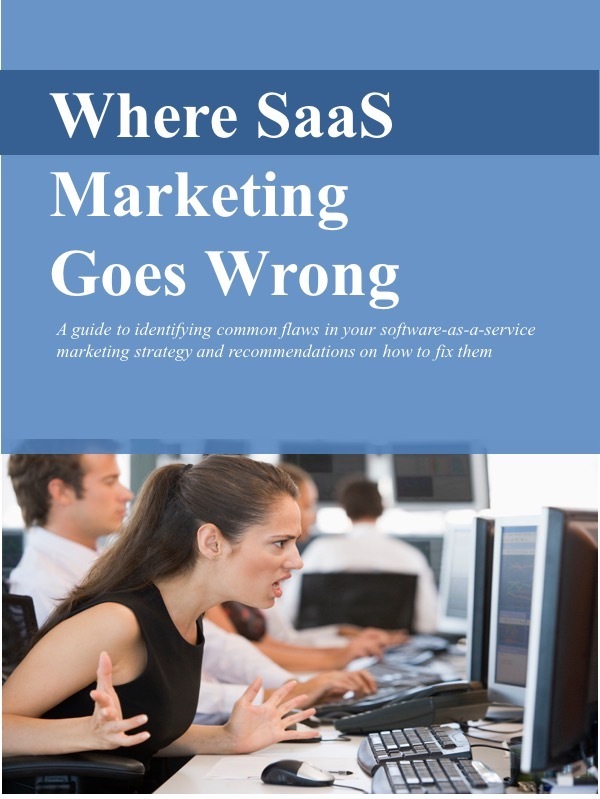 So what does that mean for software-as-a-service (SaaS) marketers? What does it mean for your messages and how you present yourselves? Look at it from the prospective customer's point of view. They'll be relying on your SaaS solution to support a key part of their business - customer management, finance, ERP, HR, whatever. They need to trust you. They need to feel confident that you understand their particular needs. "Our billing management system is focused on the meeting the special needs of veterinarians in the US"
"We deliver an HR recruiting solution built specifically for K-12 public school administrators"
"We've built an inventory management system based on our deep understanding of the food service industry." You can specialize by industry, by geography, or by company size. Those are fairly common. "We've built a solution for companies that need to coordinate long sales cycles that include multiple decision makers throughout a large enterprise"
"We're ideal for small companies struggling to attract software developers"
"Our solution eliminates the paperwork from tracking warranties and processing claims." That is, you could stake a claim to having the perfect solution to one special need which may be common to multiple industries. Of course your company probably knows a lot about other industries and other markets. And it might be easy to configure your SaaS solution to work in a variety of environments to solve a whole slew of problems. But your prospective customer usually doesn't care about what you can do for other companies in other industries with different challenges. They care about themselves. Remember, SaaS means a relationship, not a transaction. And customers want a relationship with someone that they are convinced knows their market, their business, their problems. Someone they can trust. When it comes to putting together a marketing plan, there are lots of reasons to spend first and think later. The "spending" I'm talking about is spending on marketing programs like PR, events or collateral. And the "thinking" is about developing a compelling value proposition and messages. One reason why marketers spend first and think later… it's more fun. Spending money on a clever promotional video, a tradeshow party, or a new ad campaign... that can be fun. But thinking about a value proposition… that's not fun. That's hard work. You need the value proposition in place before you can do any of the fun stuff. It's like you need to eat your broccoli before you eat dessert. You need to know who you're selling to, what problem they're trying to solve, and why they would buy a solution from you instead of somebody else. And you need to express that value proposition clearly, concisely, and consistently. Because until you have a well-articulated value proposition in place, it's difficult to get much value from the other stuff. You can spend lots of money on programs to deliver your messages: PR, search engine marketing, videos, a website, tradeshows, etc. But it won't buy you much unless you have a compelling message to deliver. For software-as-a-service (SaaS) companies in particular, that's money wasted… money that you can't afford to waste. (See "SaaS customer acquisition: Feed it or starve it?" Eat your broccoli first, then you can have the pineapple pie! So you say you want to launch a software-as-a-service (SaaS) solution. And you need to find some customers. If you're like a lot of folks, your first thought will be about a web site, search engine optimization, and adwords. Or maybe a webinar series or a social media campaign. Any of these tactics might work in your customer acquisition plan, so they may be the place you end up... but they're not the place to start. Think a step ahead for a moment. If you decide to build a new website, what will you say? If you want to implement an SEO or pay-per-click campaign, which keywords will you target? If you opt to host a webinar series, what topics will you cover? If you want to blog or tweet, what about? The place to start then: Figure out what you want to say and who you want to say it to. 1. Who needs your solution? 2. What problem do they have that you can solve? 3. And why is your solution better than alternatives? Until you can answer these questions with confidence and clarity, you're not ready to start. SaaS Marketing Lessons from ShamWow! I've never bought a ShamWow!, but I love their TV ads. The hyper-enthusiastic pitchman, Vince, tells me precisely who should buy the product, what it does, why I desperately need it, and how to buy it... all in 60 seconds! And what's true for super-absorbent towels is often true for software-as-a-service (SaaS) solutions. Sixty seconds may be all the attention you're likely to get from a prospective customer in your first encounter. If a prospect finds their way to your website, blog, booth, Twitter feed, Facebook page, press announcement, outbound call, or whatever other form of marketing communication you use, figure that they'll give you about a minute to introduce yourself. Who should buy the solution? First make it clear who should be using your solution. Explain, for example, that it's for" K-12 school administrators in Michigan," "property managers with less than 1000 properties" or "auto loan processors." The more specific, the better. Give the prospective customer a "handle" to quickly grasp what the solution is. Put it into a recognizable category, for example, "it's a document back-up system," or "it's an inventory management solution." Of course, your solution is better than everybody else's in the category, but first you need to get the prospect thinking about the right category. Once you get them in the right ballpark, then you can differentiate, as in "we're like Groupon, but much less expensive for merchants to participate,"or "we're a marketing advisory firm that specializes in SaaS for enterprises." Why do you need this solution? In classic marketing-speak, this refers to the axiom: "Talk about benefits, not features." Pitchman Vince tells me that ShamWow! will save me time and money cleaning my car, my boat, or my house. There's no mention of how it works or what it's made of, except to say that it's engineered to soak up lots of liquid. Technology companies, SaaS companies included, often fall into the trap of rambling on about their technology - lots of talk about architecture, platforms, development languages, etc. that describe how the product works. Better to focus on the problems it fixes. At least in their first exposure to a product, most customers care about what it does, not how it works. Why do you need to buy it from me? And don't forget that the alternatives aren't always other automated solutions. The competition may well be home-grown Excel- or paper-based solutions. Provide a clear path to action. ShamWow's directions - "Call now. Operators are standing by"- may not work for most business-to-business solutions. But your website should make it crystal clear what you want the visitor to do: "Download this paper," "Sign up for a free trial," "Contact us for a demo." Selling an enterprise SaaS solution is usually a multi-step process. During the first engagement with a prospective customer, you want them to take the next step forward in the process. Make it very obvious where you want them to step. Though you may not have thought much about lessons from ShamWow! for marketing a SaaS solution before now, some techniques have already been embraced. "Sign up now. Get two months free. No credit card required," isn't much different than "Buy now and we'll give you two mini-ShamWows at no extra charge!" For the last few years, NASCAR, Indy car, and Formula One drivers have been wearing a special head restraint, known as a HANS (Head and neck support) device. It's designed to prevent severe injuries from violent whiplash when the race car suddenly decelerates, as in a crash. For business folks who have been whiplashed over the past few days by the sudden jolts in the stock market, this device might look attractive for more than just race car drivers. But along with head and neck restraints to deal with volatility, businesses should be looking at software-as-a-service (SaaS) solutions as well. SaaS offers several valuable advantages in this uncertain market, and marketers should be touting them. Many SaaS subscriptions run year-to-year or even month-to-month. Companies don't need to lock-in a long term commitment. They can assess their need for the solution periodically and easily make adjustments. SaaS subscriptions often give companies the flexibility to add or subtract users as needed. There's no new hardware or software to bring up or take down. When expanding the business, companies can add users. When scaling back, they can subtract users. Most SaaS solutions can be deployed fairly quickly. Though it may take some time to input data, configure the solution and learn how to use it, the SaaS application itself is already up and running. The months required to install and customize on-premise applications is cut to days or weeks. The bottom line: your prospective customers are trying to manage in an usually volatile environment. Show them how a SaaS solution can help. The girl from Ipanema and Spinal Tap were stuck in my head - an unusual soundtrack that continuously looped through an entire weekend. You know how that happens with a song. You catch a fragment in a supermarket or an elevator. And then without warning, there's a smooth bossa nova swaying through your brain and you can't turn it off. As for Spinal Tap, an announcer on Sportscenter used the phrase, "he turned it up to 11." That set off the memory of spontaneously combusting drummers, a ridiculously tiny Stonehenge replica, and "it's such a fine line between stupid and clever." When songs or movies pop into my mind, it's tough to get them out. Sometimes what works is to go directly to the source - listen to the whole song or watch the entire movie. Fortunately, that's easy to do now. Thirty seconds and 99 cents later, "The Girl from Ipanema" was playing on my iPod. A couple of clicks on two different remotes, and I navigated my way from Sportscenter to Netflix on Demand to watch "This is Spinal Tap." What I want, when I want it. Instant gratification. Software-as-a-service (SaaS) offers this same kind of instant gratification for information and applications. Sales compensation information, marketing program ROI data, job applicant tracking, or an email newsletter service...all are just a click away. Using SaaS applications like these, you can quickly get to whatever's on your mind or on your to-do list - anytime, anywhere. All you need is a browser and internet access. There's lots of value in this instant access. Too often though, the SaaS value proposition is focused on the cost advantages. But there's so much more to SaaS than that. Make instant access part of your value proposition. Explain the benefits and advantages of solutions that are easily available anytime, anywhere. Instant gratification... customers will pay for that.